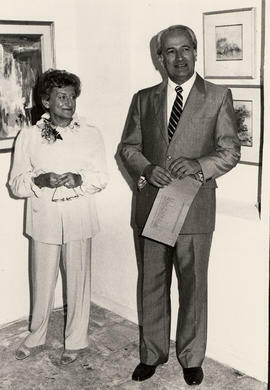 Photograph depicts Canadian Ambassador to Israel, Vernon Turner, introducing Gertrude Zack after exhibition at ARTA Gallery.Written on verso: June 30/83. June 11/83. 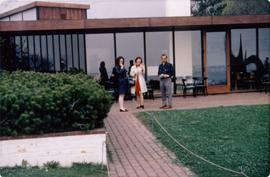 Photograph depicts Elaine and two other individuals standing out front of the Louisiana Art Gallery in Denmark. Photograph likely depicts Elaine with Lory & Warren Epstein. Photograph depicts Elaine posing with a sculpture at the Louisiana Art Museum in Denmark. The caption on the back of the photograph reads "Why Can’t I get that skinny”. Photograph depicts Elaine and Joe Glass posing with a sculpture at the Louisiana Art Museum in Denmark. Photograph depicts [Joe Glass] posing with a sculpture at the Louisiana Art Museum in Denmark. Photograph depicts Elaine posing with a sculpture at the Louisiana Art Museum in Denmark.